A hunter mounts his horse before the opening hunt with the Middlebrook Hunt Club on Saturday, Oct. 26, 2013, in Middlebrook. 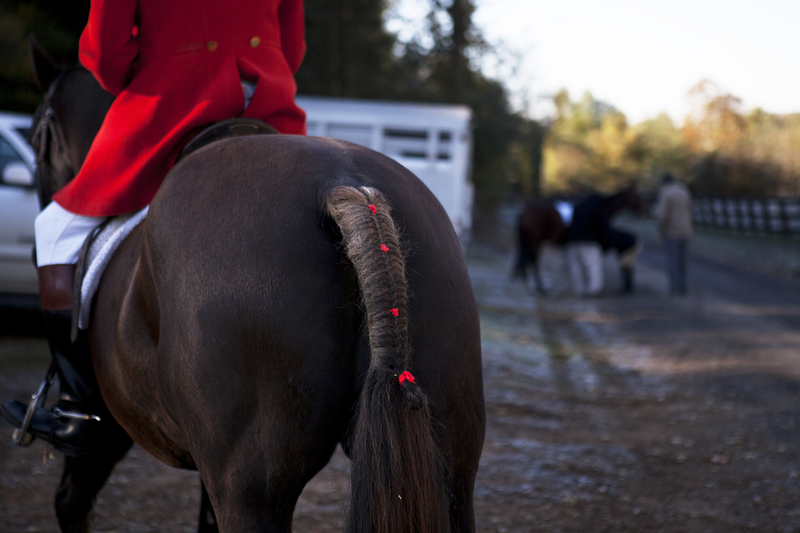 Last year, I worked on a project about foxhunting in Virginia — something that was really new to me, culturally, as I had never seen anything like it in the Midwest. The season lasts from October until around March. I began my project last year sometime deeper into the winter, so I missed the opening hunt, which is also the "blessing of the hounds." Hunters get dressed and saddle their horses before the opening hunt with the Middlebrook Hunt Club on Saturday, Oct. 26, 2013, in Middlebrook. It's a tradition dating back to the 8th century, and is tied to St. Hubert, the patron saint of hunters. A local clergyman comes out to the hunting stables, blesses the hounds, the land, the hunters and all the surrounding animals. Then, the hunters take a drink — wine was offered to the Middlebrook Hunt Club, though some also had grape juice. Hunters and a clergyman gather for the before the opening hunt with the Middlebrook Hunt Club on Saturday, Oct. 26, 2013, in Middlebrook. I don't know how often I'll be able to make it out to the hunts this season, but it was nice to be there on a Saturday this year — I wasn't often able to see Middlebrook's formal attire, pink coats and all. Hunters mount their horses before the opening hunt with the Middlebrook Hunt Club on Saturday, Oct. 26, 2013, in Middlebrook. Hunters gather for the before the opening hunt with the Middlebrook Hunt Club on Saturday, Oct. 26, 2013, in Middlebrook. Hunters gather for a photograph before the opening hunt with the Middlebrook Hunt Club on Saturday, Oct. 26, 2013, in Middlebrook.